The union representing 5,500 SAQ employees launched a surprise strike Sunday at 10:15 a.m., asking employees to leave their stores and protest peacefully. The union representing SAQ employees has launched a surprise strike day at stores across Quebec. In a brief statement Sunday morning, the union representing 5,500 employees of the government-run liquor board said it has asked employees to leave their SAQ stores and protest peacefully. The strike day began at 10:15 a.m., the union said. About 60 stores remain open across the province, a full list of which can be found on the SAQ's website, here. "Let's show our employer that we stand together and that we'll fight until the end to get a good collective agreement," the statement reads. The labour dispute centres around scheduling and job security, and SAQ employees have been without a contract for nearly 21 months. The surprise announcement comes a day before SAQ employees affiliated with the CSN labour federation were expected to hold their third, non-consecutive strike day. SAQ employees affiliated with the CSN labour federation will be on strike Monday, starting at 8 a.m.
"Enjoy today's activities to prepare for tomorrow's events," the union's statement on Sunday read. During the last strike day in August, more than 300 SAQ stores were closed, while managers kept 73 branches open province-wide. "It's clear that Sunday, there won't be any managers in the workplace. They're effectively disorganized," Gingras said. Earlier on Sunday, Simon Mathieu Malenfant, a representative for the SAQ employees' union, said the workers would hold large demonstrations on Monday, as well. "We're at the point where we're applying pressure," he said. Employees of the SAQ voted in favour of a six-day strike mandate in late June. Those days are being taken non-consecutively, however, with previous strikes taking place on July 17 and Aug. 22. Employees have also held protests in Montreal and Quebec City, among other cities in the province, to urge the government to come to an agreement. "People want to work, but nothing is moving at the negotiating table," Gingras said. The union says 70 per cent of SAQ employees are part-time workers, and that between 700 and 800 of them work 10 hours or less per week at certain times of the year. "The SAQ prefers to manage part-time [employees] working on the weekend, rather than give people stable, regular jobs," said Nathalie Arguin, president of the CSN's federation for public service sector employees, in a statement in August. "This practice pushes employees to resign after getting their training due to their work hours, or because they have to find one or two other jobs to make a living." The SAQ said that in order to resolve the impasse, it withdrew its request to move 100 vacant positions to two weekend days. "Other proposals have been made to address work-family balance concerns and job insecurity," the liquor board said in a statement. Negotiations are expected to continue this week, the SAQ said. Québec solidaire co-leader Manon Massé tweeted her support for the striking SAQ employees. 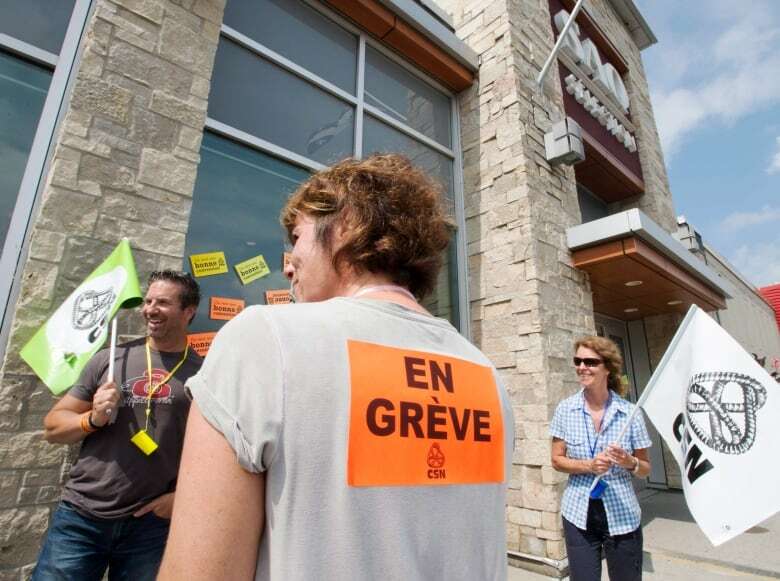 "The SAQ has 5,500 employees who deserve better working conditions," Massé wrote in French. Speaking to reporters on Sunday, Liberal Leader Philippe Couillard declined to comment on the surprise strike.